Jackie Orr teaches and writes in the fields of cultural politics and performance, feminist technoscience studies, and contemporary theory. She is an associate professor of sociology at Syracuse University, and received her Ph.D. from the UC Berkeley in 1999. Her book, Panic Diaries: A Genealogy of Panic Disorder (Duke, 2006) is a performative sociology that narrates the entangled histories of militarization, cybernetics, and technoscientific desire animating the language of psychic dis-ease. She has co-edited a special issue on ‘Enchantment’ for Women’s Studies Quarterly (2012), and published essays on “Punk Justice,” The Scholar & Feminist Online (2013); “a possible history of oblivion,” Social Text: Periscope (2013); “Body Animations (or, Lullaby for Fallujah)” in Critical Trauma Studies (NYU, 2016). For over two decades she has experimented with performance and visual/audio collage as alternative methods for re-making public memory and insurgent knowledges. Her recent performance piece on the deep time of catastrophe and the BP oil spill has been presented at the University of Chicago’s Center for Contemporary Theory, Stanford University, Goldsmiths, and the Rhode Island School of Design. Slow Disaster at the Digital Edge (duration: 40 minutes) is a live digital performance piece that assembles together the deep time of petroleum extraction, with the slow catastrophe of ordinary time in petro-cultures of toxic repetition and disposability. Refusing disaster as ‘event,’ the piece swerves thought toward the slow burn of sedimented oblivion and exhausted time. Drawing from and re-designing an image archive from the “BP disaster” in spring 2010, the performance uses a series of popular digital genres—each attuned differently to digital media’s dispersal of image, memory, body, and performance itself—to ask: How to make thinkable a catastrophe that unfolds across unthinkable, non-human time scales? What practices of thought and performance might be adequate to the times, and attentive to the re-spatializing of politics, temporalities, and affect configured by digital infrastructures? How to perform a tactical lamentation for a time beyond the wasted time of a slow, dispersed apocalypse? Light lunch will be provided at 11:30 am and the performance will begin at 12:00pm. 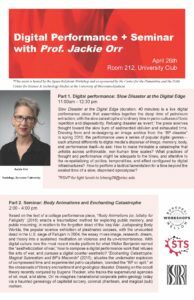 Please join us for a seminar with Jackie Orr about her article “Body Animations (or, lullaby for Fallujah)” (2016) and “Enchanting Catastrophe: Magical Subrealism and BP’s Macondo” (2015). Coffee and light snacks will be provided. All are welcome. Please contact lzheng29@wisc.edu if you have any questions. Based on the text of a collage performance piece, “Body Animations (or, lullaby for Fallujah)” (2016) enacts a traumatized method for exploring public memory, and public mourning, in relation to the forgotten dead of the Iraq War. Juxtaposing Body Worlds, the popular science exhibition of plastinated corpses, with the uncounted dead in the U.S. siege of Fallujah in 2004, the essay mixes image, research, dream, and theory into a sustained meditation on violence and its un-remembrance. With digital culture now the most recent media platform for what Walter Benjamin named the “aestheticization of war,” how to compose a digital performance work that refuses the arts of war, and pursues a digital counter-aesthetic? In the essay’s extended postscript, trauma is discussed as a cultural tendency, a tactical method for composing postdisciplinary knowledges, and a contemporary form of biopolitical governance. In “Enchanting Catastrophe: Magical Subrealism and BP’s Macondo” (2015), I situate the underwater explosion of compressed time and experimental petro-capitalism, branded the “BP oil spill,” at the crossroads of literary enchantment and geological disaster. The underwater well that blew up into the largest offshore oil spill in U.S. history was, curiously, named ‘Macondo,’ after the magical realist town that blows away in the wind at the end of Gabriel Garcia Marquez’s One Hundred Years of Solitude. Drawing on the occult theory recently conjured by Eugene Thacker, who tracks the supernatural agencies of oil, mud, and slime, I re-imagine transnational corporate petro-geology today via a haunted genealogy of capitalist sorcery, colonial phantasm, and magical (sub)realism. Space-Relations Workshop Guest Event is co-sponsored by Centered for the Humanities and The Holtz Center for Science & Technology Studies.